Delhi’s power infrastructure is being upgraded with the setting up of state of the art technology sub stations. The two sub stations which are being built at Pappan Kalan and Peera Garhi will be landmarks in the strengthening of the power transmission system of national capital in a big way. Dr. Harsh Vardhan, Union Minister for Science and Technology dedicated the 220KV substation to the Nation at Peera Garhi, here today. Sh. 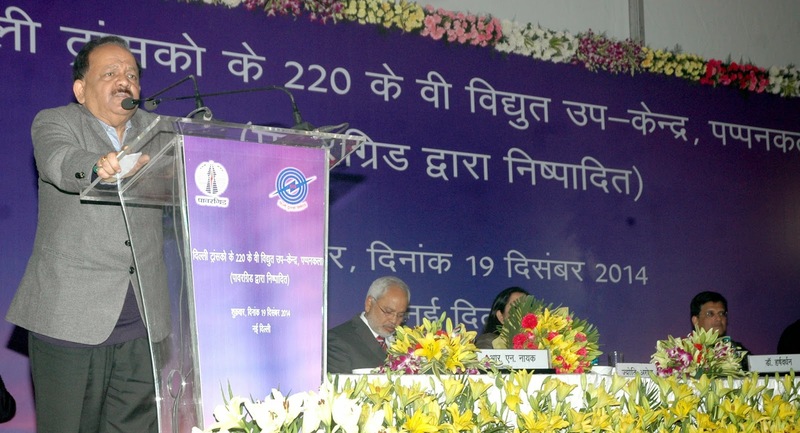 Piyush Goyal, Minister of State (IC) for Power, Coal and New & Renewable Energy presided over the function. Sh. Parvesh Verma M.P. was the Guest of Honour. Speaking on the occasion, Dr. Harsh Vardhan highlighted several initiatives taken by the Ministries of Power, New & Renewable Energy and Urban Development for the benefit of Delhiites. Shri. Piyush Goyal complimented the efforts of POWEGRID in restoring the transmission towers which were damaged in the thunder storm during last June. He said a series of short, medium and long term measures as per the Delhi perspective plan is being implemented phase by phase. The Minister pointed out that no concrete steps have been taken during the last 15 years in improving the power transmission and distribution system of Delhi. Shri. Piyush Goyal also informed that the Electricity Amendment Bill introduced in the Lok Sabha today will pave the way for the consumers to choose the discom according to their choice as in the case of telecom. He also said that steps are being drawn to ensure round the clock availability of electricity to Delhiites by 2017. The demand of Power in Delhi is increasing every year. During the last summers the demand of Power reached 5925 MW on 15th July 2014. During the few years a lot of development has taken place in North and North West parts of Delhi. Delhi Development Authority has also come up with a number of housing projects in these areas. Keeping in view the rising demand and transmission constraints Delhi Transco Limited has established a 220 KV substation at Peera Garhi in the North West Delhi. This substation has been constructed with state-of-the art technologies such as Gas Insulated Switch Gears etc. The Sub Station has been constructed at a total cost of Rs.52 Crore. It has transformation capacity of 200 MVA. The Sub Station has been linked with 400 KV Sub Station Mundka. 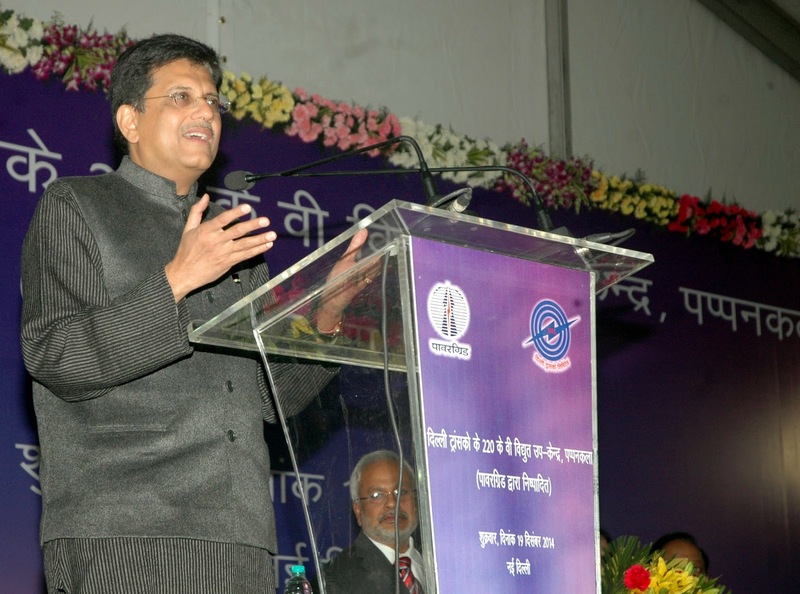 The Minister of State (Independent Charge) for Power, Coal and New and Renewable Energy, Shri Piyush Goyal addressing at the foundation laying ceremony of the 220KV Substation, at Pappankalan, in New Delhi on December 19, 2014. The Sub Station will cater to the electricity needs of mainly two DISCOMS namely BSES Rajdhani Power Ltd and Tata Power Delhi Distribution Ltd. With the commissioning of this substation the existing 220KV Sub Stations at Najafgarh, Pappankalan and Rohini will be relieved of the excess load. This substation is a land mark in strengthening the power transmission system of Delhi. This Substation will help in ensuring reliable power supply in North and North-West parts of Delhi specifically Peeragarhi, Paschim Puri, Paschim Vihar, Udhyog Nagar, Madipur, Sudarshan Park and their adjoining areas. Union Minister for Science & Technology & Earth Sciences Dr. Harshvardhan also laid the foundation of 220Kv substation at Pappan Kalan. The function was presided over by Shri Piyush Goyal, Union Minister of State(IC) for Power, Coal and New & Renewable Energy. Sh. Parvesh Verma M.P., Senior Officials of Ministry of Power, Power Department of Delhi Government and Senior Officials of POWERGRID were also present at the foundation laying ceremony. This 220 kV substation at Pappan Kalan is being executed by POWERGRID for Delhi Transco Limited (DTL). This will be 2X160MVA, 220/166KV AIS substation. This Substation will be built with state-of the-art technology and will cater to the power demand especially to West and North West Delhi encompassing the Dwarka suburb area. A. Enhancing Grid safety and security: In order to strengthen and enhance Grid safety and security, specific measures regarding maintenance of spinning reserves along with strong and effective deterrence in the form of enhanced penalties for violations of the directions given by the State and Regional Load Despatch Centres etc., have been envisaged. B. Separation of Carriage & Content in the Distribution sector: To achieve the objectives of efficiency and for giving choice to consumers through competition in different segments of electricity market, concept of multiple supply licensees is proposed by segregating the carriage from content in the distribution sector and determination of tariff based on market principles, while continuing with the carriage (distribution network) as a regulated activity. To protect the interest of consumers, the tariff for retail sale of electricity is proposed to be capped through the Regulator and one of the supply licensees is proposed to be a Government controlled company. Further, the existing distribution licensees are proposed to continue till the expiry of their term as specified in their licence. C. Promotion of Renewal Energy: In order to accelerate the development of Renewable Energy sources, a number of measures including the provision for a separate National Renewable Energy Policy, development of renewable energy industry, Renewable Generation Obligation on coal and lignite based thermal power plants, specific exemptions to Renewal Energy sources from open access surcharge, separate penal provisions for non-compliance of Renewal Purchase Obligation etc., have been envisaged under the Renewable Generation Obligation for coal and lignite based thermal power plants. D. Tariff Rationalization: To rationalize the tariff structure on sound financial principles for the viability of the distribution sector and recovery of revenue requirement of licensees without any gap, the provisions of Tariff Policy are proposed to be made mandatory for the determination of tariff. Further, the bill envisages timely filing of tariff petitions by utilities, disposal of the same by the Appropriate Commission within a specified time period and powers to Appropriate Commissions for initiating suo-motu proceedings for determination of tariff in case the Utility/Generating Companies do not file their petitions in time. E. Miscellaneous : Suitable amendments are also proposed for improving the accountability and transparency in the working of Appropriate Commissions without affecting their functional autonomy; bringing clarity in regard to appointments, functions and powers of the Chief Electrical Inspector/ Electrical Inspectors and levying of fees for electrical inspections; exemption to developer of SEZs, Railways and Metro Rail for obtaining distribution licence; collection and realization of any dues along with the electricity dues, etc. Very long and nice article, Thank you.